We hope you are excited about our Time Challenger give away! We love our fans and we love to help with the support uses for the Time Challenger Products. Please fill out this short survey to be registered to win FREE Time Challenger Products! 1. Do you currently use natural Products for preventative health care? 2. Are you interested in learning more about Herbs, Supplements & Essential Oils? 3. 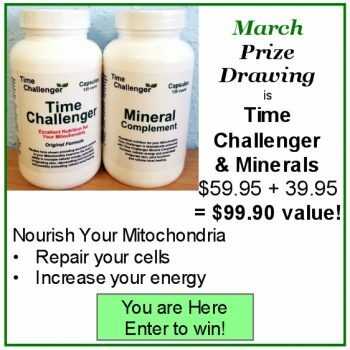 Do you currently use Time Challenger supplements? By Clicking ‘Enter Me Now’ I agree to the official rules of the is contest. You are a resident of the USA. You are over the age of 16. Only one submission per person.